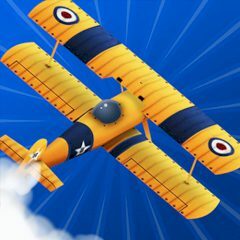 We propose you to become the best pilot of this plane! There are a lot of tasks that you have to perform. Just drive perfectly and you will have so much fun! Who knows, maybe you are the only one, who can cope with it and set the best record. Go ahead! Have you ever dream to control a real single propeller Plane and you have to fly over San Francisco? Well, now all your dreams will come true! Just complete various stunt missions here. You have to put on your aviators and grab your fur-lined jacket it is time to fly in this realistic aerobatics flight simulator! So, you can do it using the joystick and speed button, and guide your plane through the air and successfully fly through the obstacles to win! But, of course, try not to make a crash! Are you ready? Then move forward immediately! Vanquish this game.